Poster for the NROL-79 mission, which is scheduled to launch at 12:50 p.m. EST (1750 GMT) on March 1, 2017. A U.S. spy satellite will take to the skies today (March 1), and you can follow the liftoff live. Wednesday, a United Launch Alliance (ULA) Atlas V rocket is scheduled to launch the NROL-79 spacecraft to Earth orbit from California's Vandenberg Air Force Base at 12:50 p.m. EST (1750 GMT). You can watch the launch webcast here at Space.com, beginning at 12:30 p.m. EST (1730 GMT), courtesy of ULA. NROL-79 was originally scheduled to launch on Dec. 1, but its liftoff date was pushed back because of two separate issues: first, a September wildfire at Vandenberg, and then a problem with the two-stage Atlas V's upper stage. 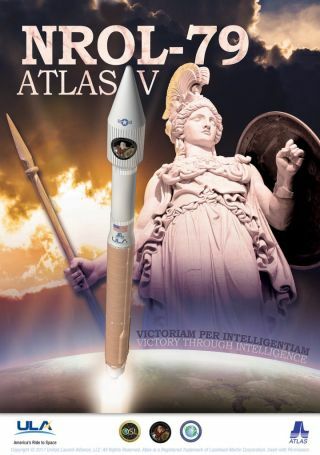 Wednesday's launch will mark the 70th for the Atlas V, which debuted in 2002, and the 35th for the rocket's 401 configuration, which does not incorporate any strap-on solid boosters. All 69 of the Atlas V's liftoffs to date have been successful. The NROL-79 launch will be the first NRO space mission of 2017. Three NRO satellites were lofted to Earth orbit last year; the most recent, NROL-61, blasted off on July 28.